Lucid dreaming on weekday mornings poses a challenge for me; I usually know the time, and that I’m minutes away from a wake-up call. It’s hard to enjoy the surroundings or conversation when the first words out of one’s mouth are, “Speak quickly; something’ll wake me up soon!” I’ve needed to get places quickly in dream-time (typical mum-speak, isn’t it?) and sometimes the illusion of movement has to be foregone, giving me a “wipe out, wipe in” transition–I go into a black or gray space, and details of my next destination fade in until the full view is formed. Sounds or sensations frequently come in before the visuals, and I simply focus on what I have until the world is filled in. My destinations have been all sorts, and I usually don’t set out to create them, preferring to explore and meet people I don’t expect. But in the occasional quest for information I have tried putting the answers I want (or sources of the answers) on the other side of a door. Programming/incubating the dream from within the dream, I’m disappointed to say I’ve always been woken up by real-world disturbances (arrrgh!) before opening the door. I only managed something different this morning, but, not seeking information, I decided to try the “to infinity and beyond” challenge from the Lucid Dreaming Experience. 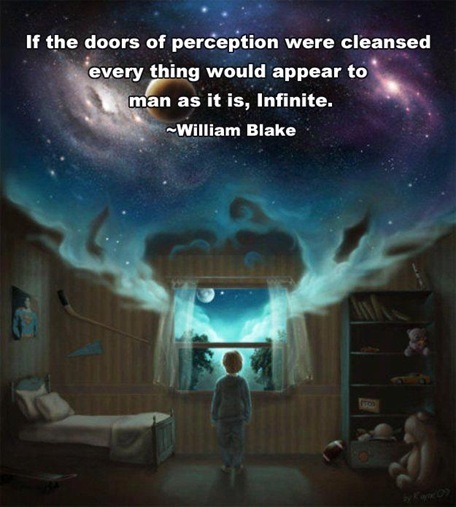 It is finding a door in your dream, tracing the infinity symbol on the door while saying the words “to infinity and beyond”, and then stepping through. Good for time-strapped dreamers. I was flying above an “ancient landscape” as the infinity idea came. Doors are hard to come by in the middle of a sky. So I created a tiny airplane around myself, the kind you would explore the Grand Canyon with, and found myself leaving the plane on autopilot while I made my way to the door in the side of the cabin. “To infinity and beyond”, I said, as I traced my infinity sign with a finger in the door. When I opened it, all I saw was the landscape below flying by. There was no question in my head that I was going to jump out of the plane anyway; I was so conscious it was a dream. I had some quick ruminations on the nature of death, then shouted “surprise me!” as I jumped. I was floating, then found myself sinking softly into a sofa, that had cushions of dirty yellow streaked with light blue and green threads. “Infinity” is apparently a yellow couch somewhere of an acquired taste–and yep, that was certainly surprising. Wondering whether my sheets at home actually looked like that, and conscious I was lying down in the dream in the same position I was sleeping, I was momentarily confused. “Needing” to ascertain where I really was, I woke up to my daughter staring at me. Dream re-entry was not an option. This was something I discovered I could do within the last 2 weeks. It was a semi-lucid dream in which I’d recalled my daughter wanted to spend “dream time” with me (something we talked about before sleep) and since I was intrigued by where I was–a welcoming hotel/hostel lobby–I found myself on the phone literally trying to “call” her to me. This was deeper in the night (nowhere close to the wake-up call) and I described the space I was in. As I was doing so, something in the real world woke me up, to my dismay, but it was slowly enough that I kept telling myself “Save! Save! Save!” like it was a computer game. The amusing thing was that I was able to “load” the same setting/point in the dream twice later the same night, by being so utterly sleepy yet intent on describing the last things I’d seen that it felt like self-suggestion and wake-induced lucid dreaming combined. I never got far from the hotel lobby but I was pleased with this ability to re-enter a dream in the right conditions–much to do with timing and my state of consciousness. Practising dream yoga has now become habit in the middle of the night, but I will describe it in a separate post.